It’s 3 am, the phone rings and the day begins. You force yourself into a not-quite-dry immersion suit and boots, get out on deck and grimace as the polar wind blows its choice of rain, hail or snow in your face. After taking receipt of the precious cargo of samples that the nets and water bottles deliver, it’s straight to the temperature controlled laboratory at 1 degree Celsius. No natural light, only cold. And it’s Groundhog day - every day of this 6 week voyage is a variation on this theme, with sessions in the cold room being interspersed with work on deck, feeding (that’s what meal times have been reduced to) and sleeping if/when the schedule permits. But we wouldn’t have it any other way. This is what we came for. Our schedule and conditions of work are unlikely to be everyone’s cup of tea, but for us this is about as good as it gets (or maybe I speak for myself?). Far from the madding crowd. Literally. We're working in the South Atlantic, somewhere not too far from South Georgia, trying to understand how marine organisms remove CO2 from the atmosphere and store the associated carbon in the ocean. This process begins with the microscopic plants that we call phytoplankton, literally ‘drifting plants’. Just like plants on land, phytoplankton take CO2 from the atmosphere and combine it with water to make sugars. And so begins the marine food chain and the transferral of CO2 from atmosphere to ocean. The work of myself and many others on this ship is looking at the next link in the food chain – the zooplankton. These ‘drifting animals’ span a huge size spectrum, from water flea-like animals that are about as long as the hair on the back of your arm is wide, to jellyfish the size of dustbin lids. Zooplankton are the wildebeest of the oceans, travelling huge distances each night from the oceans depths to feast on phytoplankton in the surface ocean under the cover of darkness. At least that’s what the text books say. Here, the main phytoplankton are super-sized and armoured with glass. Imagine crunching your way through an oil tanker-sized piece of broccoli wrapped in glass. Hardly the ideal meal. We're using a range of nets to understand the distribution of zooplankton throughout the water column, from 500m to the surface. 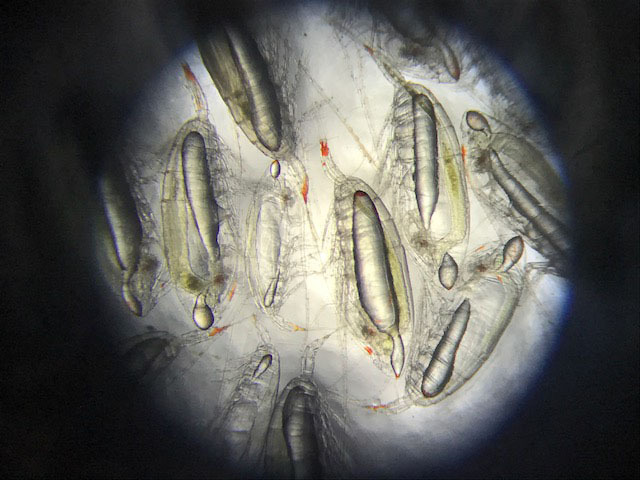 We’re also running experiments to determine what the zooplankton are, and are not, eating, and ultimately aim to understand how this diverse group of animals influence the fate of atmospheric carbon that has been converted into phytoplankton. We’re also trying to determine the nutritional requirements of these animals, which will help us better understand what they need to eat to achieve healthy growth and what may happen if they can’t find the appropriate food as the climate changes.